When most people start planning their travel to Iran, they include cities such as Shiraz, Isfahan, Yazd, and Tehran. However, attractions of Iran does not limit to these cities, and there are also others that you can consider to visit. As an example, the city of Kerman, with a great heritage and numerous places to visit. In addition to numbers of sites to visit in Kerman, there are many artistic handicraft and souvenirs from the city, such as traditional embroidery known as Pateh, handmade carpets and rugs, Jajeems and Kilims (a coarse carpet). The city of Kerman also known for delicious sweets, the same as Kolompe, Komaj, Ghotab, Paloodeh Kermani and also cuisines like Boz Ghormeh, cabbage pottage, and Shooli pottage. So, don’t forget to treat yourself with these delicious sweets when you are in Kerman. A trip to Iran is not completed without visiting at least one of the Persian Gardens. There are nine gardens in Iran known as the symbols of Persian Gardens’ concept, listed as World Heritage Sites of UNESCO in 2011. These gardens dated back to different periods and located in as many provinces all over the country. Baghe Shazdeh or Shazdeh Garden was built by the governor of Kerman in the 1890s. It has a rectangular shape at the middle of the garden, with a pavilion at the end of the garden with a scenic view of the garden, and also the central canal. The garden is at the heart of a desert, which makes it really magnificent. The city of Bam and its cultural landscape were listed as the World Heritage Site of UNESCO in 2004, one year after the 2003 earthquake. The most interesting site of the city is the Arg-e Bam (Bam Citadel) with a history of 2,000 years at the Parthian Empire (248 BC – 224 AD). The Citadel is the best example of a fortified medieval town built in mud layers. Unfortunately, most of the citadel was destroyed after the earthquake of 2003. However, even by considering the damage that happened to this magnificent place, you can still imagine the beauty of it. Ganjali Khan Complex was built in the Safavid era by the governor of the city named Ganjali Khan, in the old district of the city. 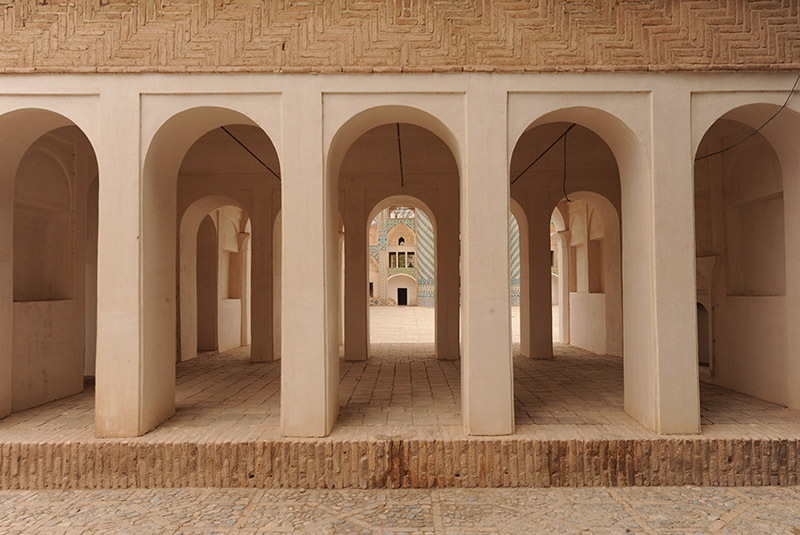 The architect of the complex was Mohammad Soltani from Yazd. There is a square, a school, a caravanserai, a bathhouse, a mint, a mosque and a bazaar at the complex. The complex covers an area of 11000 meters square, at the center of a large public square, which is aligned with Vakil Bazaar in the east to west direction. Fathabad garden is located about 16 kilometers far from the city to the north-west. According to historical evidence, it is believed that the place was supposed to be the main field of construction of Shazdeh Garden. The garden was built around the late 1800s, during Qajar Dynasty under the managing of “Fazl Ali Khan Biglarbeygi” who was the ruler of Kerman. That is why it is also called Biglarbeygi Garden. There used to be a Qanat water passed through the garden in the past. At the eastern side of Kerman, there is a historical building with a huge eight-angle dome, made of stone, which has been saved from the trespassing hand of time. There is a door in every eight sides of the building with the width of two meters, which recently have been closed by stones to improve strengthen the building and the only one remains open is the entrance door to the building. The upper side of the dome has been made of brick and it is not clear whether or not had it been decorated by tile-work. Inside the dome, there were apparently plaster-works that have been destroyed. There is no any document about the time of construction. This beautiful mausoleum is located at the center of Mahan and known as historical complex, which contains the mausoleum of Shah Nematollah Vali, the renowned Iranian mystic and poet. Shah Nematollah Vali died at the age of 100, about 6 centuries ago. The tomb of Shah Nur-eddin Nematollah Vali, a poet, Sufi and founder of an order of dervishes, has twin minarets covered with turquoise tiles from the bottom up to the cupola. The mausoleum was built firstly by Ahmad Shah Kani, and the completed at the time of Shah Abbas I, Mohammad Shah Qajar and Nasser-al-Din Shah. 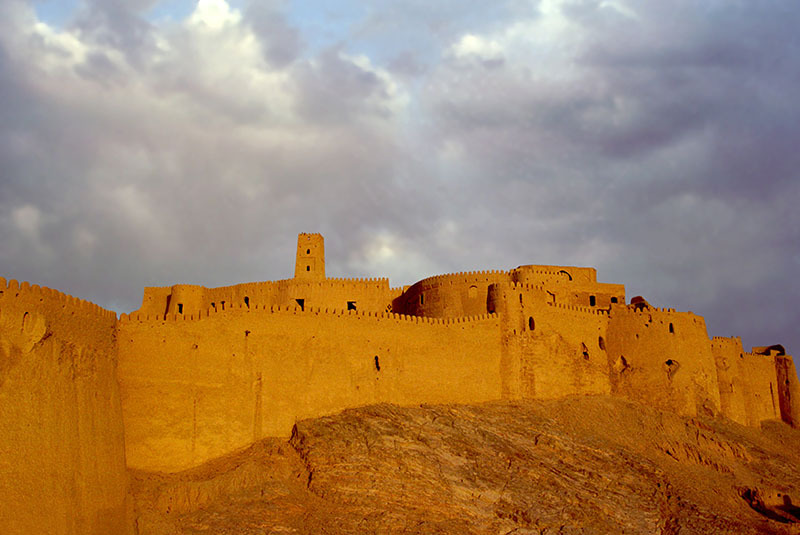 Rayen castle or Arg-e Rayen is an adobe castle in Rayen town in Kerman. The castle probably remains you the Arg-e Bam. Rayen displays all the architectural elements of a deserted citadel. It appears extremely well preserved, considering the numerous natural disasters that have been destroying similar structures nearby, and it is one of the most interesting historical sites in Iran. The monument dates back to the Sassanid era and covers a 20,000-square-meter area. The essential sectors such as Zoor khaneh (gymnasium for a traditional Persian sport), mosque, and stable can be seen in the citadel. The Grand Bazaar of Kerman, is one of the oldest trading centers in Iran, with beautiful manifestation has left as a memorial from the ancient periods. 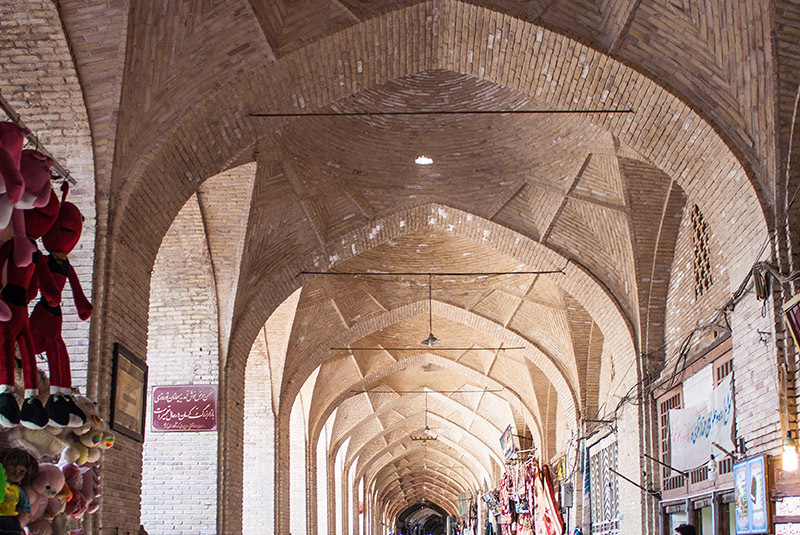 The architecture of the Kerman bazaar reflects the geographical conditions and climatic circumstances of Iran in the past. Such architecture works indicate the style of architecture in the Sassanid era. The museum was officially opened in 2005. Among the oldest items preserved at the museum is a handwritten copy of Gathas (17 hymns believed to have been composed by Zoroaster himself) estimated to be over 200 years old, and one handmade Afringan (fire brazier) upon which the year 1207 (1828) is engraved. Rare documents and photos of notable personalities like Keikhosro Shahrokh, Mirza Borzu Amighi, and Keshvar Khanum are also on display at the museum. Lut Desert is a large salt desert in the provinces of Kerman and Sistan and Baluchestan and is the world’s 25th largest desert. The surface of the sand there has been measured at temperatures as high as 70 °C (159 °F), and it is one of the world’s driest and hottest places. Lut Desert was inscribed to the UNESCO World Heritage Sites list in 2016.